The stigma of the perception that the PWD only has ‘himself to blame’ is something Opinion Leaders are often faced with – contributing to shame and self-blame. For many, anxiety is a constant companion, along with the juggling and balancing to maintain the ‘right’ sugars that make up the the day to day reality of a PWD. 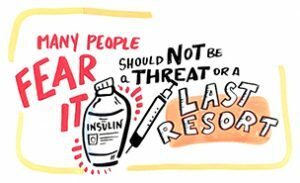 Aida family’s perception of being on insulin is based on myths and misperceptions from generations back. She welcomes becoming more involved as an Opinion Leader and took heart from Heather – an established Opinion Leader and nurse who diagnosed herself 22 years ago. Even with the daily rigors of managing, Heather doesn’t consider herself ‘sick’. Beyond each person’s family and social circles, there’s the healthcare world and its inconsistencies. 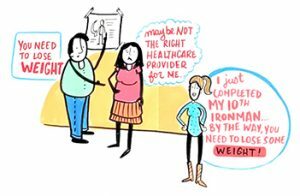 Lori and Heather share what they’ve seen time and again in their role as Opinion Leaders: the ‘credibility’ factor: health care practitioners that PWDs can’t relate to – whether it’s a healthcare professional who is totally out of shape, or in ‘Iron Man’ top condition. This applies across the board: physicians, nurses, foot doctors and even dietitians. There is much to be learned by PWDs and the world around them: Often there’s the perception that one-size-fits all. That just doesn’t apply to a PWD – where one PWD’s normal may be a ‘6’, for another it’s something else. Heather pointed out, it takes an effort and ‘a lot of talking ’ to establish what’s ‘right’ for each PWD. In an effort to ensure that all staff get a sense of the day to day for a PWD, her Diabetes Center has every new staff member live for a week like a PWD. They are given props – empty needles and ‘smarties’ for pills. They have to record what they eat and drink and how they’ve exercised. This goes a long way to being more empathetic to the ‘lived experience’ of PWDs. Jim points to larger problems: A Government that’s out of touch with health costs for PWDs– a particular hardship for many who have no insurance coverage. 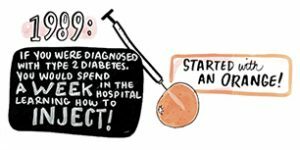 Those with Type 2 Diabetes spend on average between $723 and $1,914 annually. Seniors pay 36%-70% out of pocket for Type 2 Diabetes treatment. Against international comparisons, Canada also performs poorly with respect to diabetes-related hospitalizations, mortality rates, and access to medications. 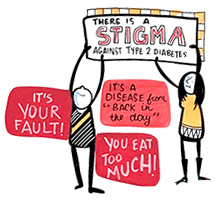 Diabetes and its comorbidities pose a significant burden on people with diabetes (PWD) and their families, through out-of-pocket expenses for medications, devices, supplies, and the support needed to manage their illness. Rising direct and indirect costs of diabetes will become a drain on Canada’s economy and undermine the financial stability of our health care system. A personalized approach to medication access, to meet individual needs and optimize outcomes, is also a key enabler. 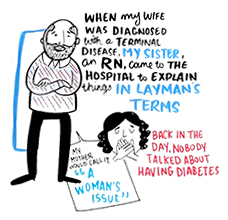 PWD and prescribers need reimbursement approaches that allow them to use existing tools (ie, medications and supplies) to manage diabetes in a timely manner and to avoid and/or delay major downstream complications. One of the tenets of Patient-centered care is care coordinated around the patient, rather than around the system. For a PWD, it takes a team. Heather, who’s worked in the Diabetes Management Center since its inception in 1991, has become a leading Opinion Leader in team-work and patient-centered care – involving Dieticians, Exercise, Foot Care and special attention to the sores that may not be healing properly – a hazard for a PWD. The key to Heather’s success was buy-in from the Family Doctors. 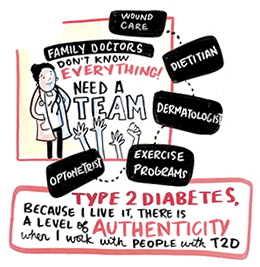 She points out that it’s unfair to expect Family Doctors to know all aspects of Diabetes Care. At the same time, it was essential to assure these good doctors that the intention was not to take patients away, but rather encourage them to embrace the interprofessional teamwork necessary for PWDs to manage. This took a concerted, proactive effort that proved effective. Along with creating interprofessional support for PWDs, Heather’s team is cross-trained with each team member well-versed in every aspect of care: the dietician can examine feet, the nurse can counsel on diet. 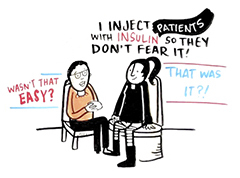 One of the things Heather tackles in the early visits is the fear of going on insulin. She shares her modus operandi: talk about it right up front, as the reality is, insulin is likely in many PWDs future. Aida, diagnosed 7 years ago, feels she now does a better job of managing. That’s an outcome of person-centered care: when patients and caregivers’ needs are met, this can lead to more self confidence in patients’ own ability, thus putting energies toward day to day management. As an Opinion Leader, Aida also embraces technology in her care-related communications tactics – sending pictures to her healthcare professionals when she needs answers. She’s become a fully engaged PWD. Since her own diagnosis, in 1989, Heather has witnessed a huge change in care for PWDs: back then testers were the size of toasters, and patients going on insulin were hospitalized for a week, using an orange to learn how to inject. Now, testers are portable, clinics replace hospital ‘stays’ and patients are encouraged to become more empowered and engaged. 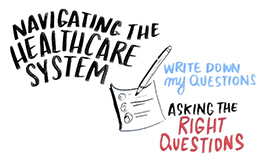 However, Jim points out one of the barriers that he feels healthcare professionals could be more sensitive to: PWDs often don’t even know what questions to ask nor do they understand the language and terminology. Aida shares how, in her evolution as an engaged PWD, she now takes notes and then does her own internet research. These patients, caregivers and Opinion Leaders hold out hope that the future will see what Heather has described as the Gold Standard for Diabetes Management: incorporating team-work, cross-training and seeking partnerships, such as working with the Emergency Department to get patients with Type 2 Diabetes out of ER and into the Diabetes Management Centre.